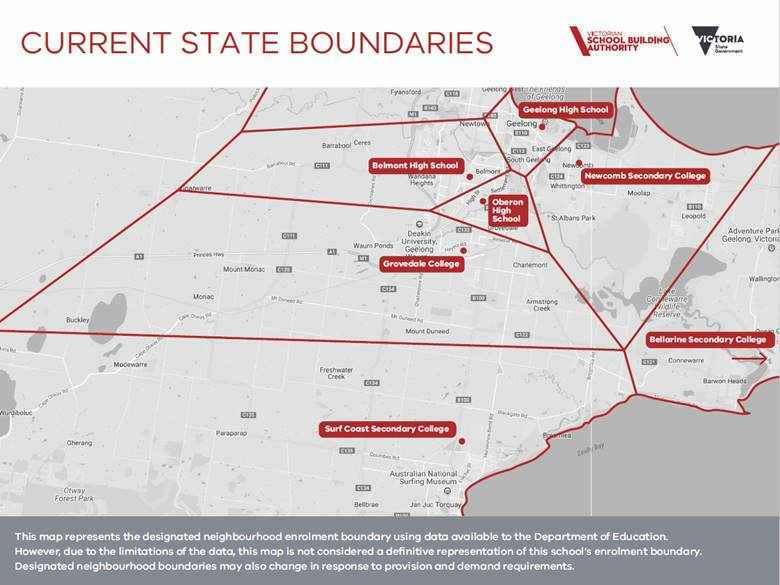 Current State Boundaries apply for enrolment at year levels 8 – 12. Future State Boundaries apply for enrolment at Year 7 only. All enrolment enquiries are to be made through the General Office. Please call 5243 5355. Belmont High School follows the Department’s Placement Policy and timeline. A child’s ‘Designated Neighbourhood School’ is the school that is nearest the student’s permanent residence. We enact the ‘Priority order of placement’ rules when enrolling students into Year 7 for the following year. While parents/guardians have primary responsibility for transporting their children to and from school, the School Bus Program assists families in regional Victoria by transporting students to/from school. Categories of eligibility determine whether a student travels at no cost or travels upon the payment of a fare. Students wishing to access a seat on a bus must complete an application form and parents/guardians must agree to the conditions of travel including, if applicable, the payment of a fare. This fare must be paid to the school at the beginning of each term for the child to be eligible for a seat on the bus. Public Transport Victoria determines the fares. – Attend their closest government school. – Reside 4.8km or more from the school. (The distance is measured by the shortest practicable route from the students’ front gate to the school’s main entrance.) This applies where there is a contract bus service in place. If there is no Contract Bus System in the area where you reside, a Conveyance Allowance may be applicable if you fit the above criteria. *SEALP students are eligible but only if they live 4.8km or more from the school. For further information go to www.education.vic.gov.au/travellingtoschool for the School Bus Program’s policy and procedures. This policy is effective from November 2013.